This guest post was written by Tim McDonnell, Climate Desk, and was originally published here. Back in 1999, Penn State University climate scientist Michael Mann released the climate change movement’s most potent symbol: The “hockey stick,” a line graph of global temperature over the last 1,500 years that shows an unmistakable, massive uptick in the 20th century, when humans began to dump large amounts of greenhouse gases into the atmosphere. It’s among the most compelling bits of proof out there that human beings are behind global warming, and as such has become a target on Mann’s back for climate denialists looking to draw a bead on scientists. Today, it’s getting a makeover: A study published in Science reconstructs global temperatures further back than ever before—a full 11,300 years. 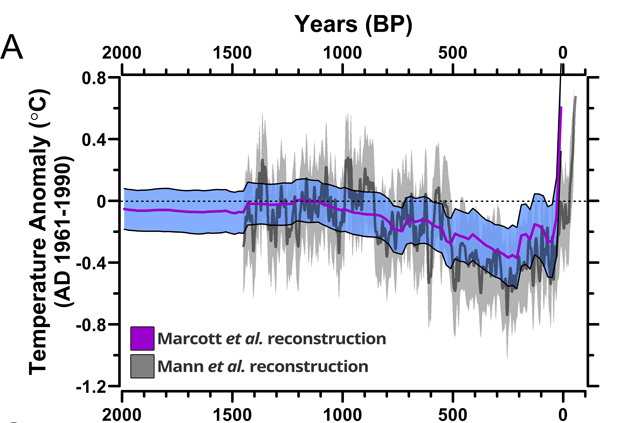 The new analysis finds that the only problem with Mann’s hockey stick was that its handle was about 9,000 years too short. The rate of warming over the last 100 years hasn’t been seen for as far back as the advent of agriculture. To be clear, the study finds that temperatures in about a fifth of this historical period were higher than they are today. But the key, said lead author Shaun Marcott of Oregon State University, is that temperatures are shooting through the roof faster than we’ve ever seen. “What we found is that temperatures increased in the last hundred years as much as they had cooled in the last six or seven thousand,” he said. “In other words, the rate of change is much greater than anything we’ve seen in the whole Holocene,” referring to the current geologic time period, which began around 11,500 years ago. 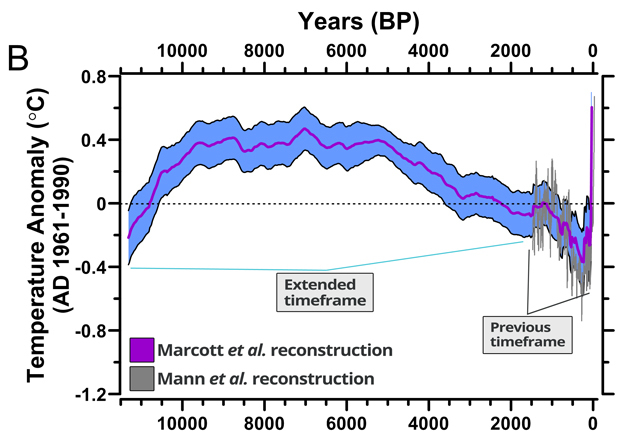 Previous historic climate reconstructions typically extended no further back than 2,000 years, roughly as far back as you can go by examining climate indicators from tree rings, as Mann did. To dig even deeper, Marcott’s team looked at objects collected from more than 70 sites worldwide, primarily fossilized ocean shells that have been unearthed by oceanographers. 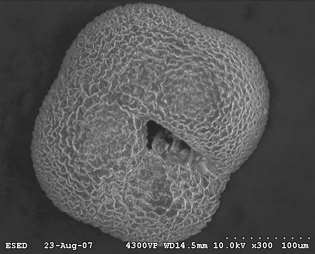 Existing research has shown that certain chemical tracers in the shells link directly to temperature at the time they were created; by studying oxygen isotopes in the fossilized plankton shown below, for example, scientists can deduce that it formed its shell at a time when Greenland was fully without ice. Marcott’s task was to compile enough such samples to represent the whole planet over his chosen timeframe. “There’s been a lot of work that’s gone into the calibrations, so we can be dead certain [the shells] are recording the temperature we think they’re recording,” he said. Today’s study should help debunk the common climate change denial argument that recent warming is simply part of a long-term natural trend. Indeed, Marcott says, the Earth should be nearing the bottom of a several-thousand year cool-off (the end-point of the rainbow arc in (B) above), if natural factors like solar variability were the sole driving factors. Instead, temperatures are rising rapidly. Marcott admitted he was apprehensive about charging into the fully mobilized troll army, but said he was grateful scientists like Mann had “gone through hell” before him to build a support network for harassed climate scientists.